Boca Raton Airport (IATA: BCT, ICAO: KBCT, FAA LID: BCT) is a state-owned public-use airport located two miles (3 km) northwest of the central business district of Boca Raton, a city in Palm Beach County, Florida, United States. The airport is immediately adjacent to Florida Atlantic University and to Interstate 95. The Boca Raton Airport is publicly owned and is designated as a general aviation transport facility governed by a seven-member Authority appointed by the City of Boca Raton and Palm Beach County Commission. Boca Raton Airport covers an area of 214 acres (87 ha) and has one asphalt paved runway designated 5/23 which measures 6,276 x 150 ft (1,913 x 46 m). The airport has a control tower which is manned from 7:00am to 11:00pm. There are two full-service fixed-base operators, Signature Flight Support and Atlantic Aviation. The Burton D. Morgan School of Aeronautic of Lynn University is located at the airport. For the 12-month period ending April 30, 2018, the airport had 81,550 aircraft operations, an average of 223 per day: 93% general aviation, 6% air taxi and <1% military. At that time there were 212 aircraft based at this airport: 118 single-engine, 25 multi-engine, 66 jet and 3 helicopter. The Boca Raton Airport was established in 1936. In 1941, in response to the emerging Axis threat, the United States began to rapidly mobilize and expand its armed forces. In addition to enlarging its Army and Navy, the US also sought to expand its air forces. The service we know today as the U.S. Air Force was known prior to June 1941 as the U.S. Army Air Corps and after June 1941 as the U.S. Army Air Forces, and was a subordinate branch within the U.S. Army. To expand the air corps/air forces, new air bases were established throughout the United States, including bases in southern Florida at Homestead, Morrison Field in West Palm Beach, and at the Boca Raton Airport. The Boca Raton Airport, also known as Boca Raton Army Airfield, was selected to house a military airfield for a number of geographic and practical reasons. Southern Florida's climate and physical geography are generally considered mild compared to most northern locations. Florida experiences a winter climate characteristic of the subtropics. Lacking snow or low temperatures enabled military operations to continue year round. Florida also has consistently flat terrain, an ideal feature when training new and inexperienced pilots. 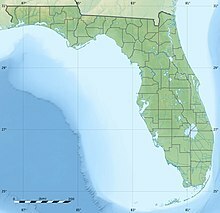 Its location adjacent to the Atlantic Ocean and the Gulf of Mexico also provided ideal locations for flight training. Boca Raton was also chosen for practical purposes. In the early-1940s, Boca Raton's population numbered only 723. This enabled the United States government to take thousands of acres of land for its use without having to relocate a large number of people. However, this is not to say that the establishment of the military airfield was without controversy. A majority of the land was acquired from Japanese-American farmers from the failing Yamato Colony, the land having been seized through the process of eminent domain, leaving many Japanese-Americans little recourse in the early days of World War II. All of these conditions enabled construction of the military airfield to commence in June 1942. While most of the Boca Raton Army Air Field was deactivated in 1946, more than 800 acres (3.2 km2) were retained as the Boca Raton Air Force Auxiliary Field. Another 85 acres (0.34 km2) were used in the 1950s for a secret project to produce stem rust spores for possible use as a biological agent against wheat production in the Soviet Union. Other parts of the World War II air base were returned to private ownership and developed. In 1959 the remainder of the base was turned over to the City of Boca Raton and to the State of Florida. 200 acres (0.81 km2) and a single runway (of three original runways), completely rebuilt, became the Boca Raton Airport. The remaining land became the campus of Florida Atlantic University. The airport's first control tower opened in 2000. The airport suffered more than $12 million worth of damage to hangars when Hurricane Wilma passed through the area in October 2005. In 1997, the restored original Aston Martin DB5 'Effects Car' from the James Bond film "Goldfinger" was stolen from a hanger at Boca Raton airport. A U.S. Customs and Border Protection facility was scheduled to open in 2017 in order to allow Boca Raton Airport to process passengers arriving on international flights. Boca Raton Airport's Customs and Border Protection facility opened in May 2018. ^ a b c "The History of the Boca Raton Airport". Boca Raton Airport Authority. Archived from the original on 2010-01-23. Retrieved 2006-10-21. ^ "The Yamato Colony: Japanese Pioneers in Florida". The Morikami Museum and Japanese Gardens. Retrieved 2006-11-04. ^ "A Journey Through Boca Raton: Timeline 1895 — 1999". Boca Raton Historical Society. Archived from the original on 2013-04-14. Retrieved 2006-10-21. ^ "U.S. Military in Boca Raton - Post-War Military Secrets". Palm Beach County History Online. Historical Society of Palm Beach County. Retrieved 22 August 2014. ^ Moore, S. Clayton. "Avitat Boca Raton Brings the Wow Factor to FBO Management". Airport Journals. Archived from the original on July 7, 2011. Retrieved December 15, 2007. ^ Valdemoro, Tania. "Boca Airport Damage Hits $12 Million". Palm Beach Post. Retrieved December 15, 2007. ^ Sun-Sentinel, South Florida. "Boca Raton upgrading its airport". Sun-Sentinel.com. Retrieved 2016-04-22. ^ "Pilot Praises CBP Facility for Fast, Efficient and Friendly Service" (press release). Boca Raton Airport. June 4, 2018. This page was last edited on 21 February 2019, at 13:19 (UTC).